The RSPCA on rescue groups: "... a way for people simply to legitimise hoarding behaviour"
So I went to write a post today about something that will effect rescue groups significantly, and I realised that I’d already written it back in September last year. And this is worrying because that means this bad, bad, not good thing I wrote about mid last year seems to be steadily moving forward. So, please before you read the post below pop over to this link and read this first. Done that? Ok - good. You now you know about Dr Haston who spoke at last year’s RSPCA Science seminar on why their ability to get pets out of their facilities alive is not the metric major shelters want you to judge them on. And why in his opinion, rescue groups are a probably hoarders waiting to happen. We also know that the RSPCA is pulling out of council pound services nationally. This policy began around the end of 2016, and expanded pretty rapidly throughout 2017/18 with multiple rural shelters being closed and/or sold off. In 2007/08 (ten years ago) the RSPCA QLD took in 17,257 dogs. Last year (2017/18) they took in just 10,018 (40% less). In 2007/08 (ten years ago) the RSPCA NSW took in 22,676 dogs. Last year (2017/18) they took in just 9,250 (60% less). While the load on rescue groups - and their profile more generally - has never been higher. But worse for these shelters-who-don't-want-to-be-judged-by-their-live-release-rates, rescue groups seem to be offering a superior service to the community. Not only are they directly members of the community that they serve, making their solutions generally more compatible with the local situation; the model of putting pets into homes gets undeniably better results behaviourally, than say, the model of putting pets into shelters where 40% or 50% of pets have traditionally failed so called “temperament tests”. - Loss of access to pets, as rescue groups form relationships with Councils. The “No Kill” shelters have made it extremely difficult for other animal welfare agencies to fundraise effectively and retain a strong staff and volunteer base. However the public would rather pull the wool over their eyes and donate and bequest to an organisation that appears to be doing the right thing. It gives them a warm and fuzzy feeling. But the truth is these organisations are helping less animals and placing more strain, financially, emotionally and physically, on other shelters. But hangon, Shel - I hear you saying - the RSPCA is talking about No Kill shelters here; not rescue groups. They’re different things! Well, yes. Yes they are. But that’s not what the RSPCA is driving at here. 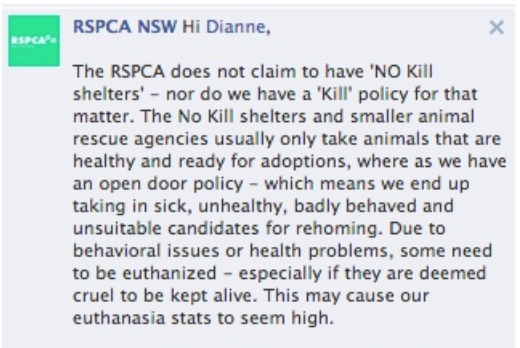 The number of “No Kill shelters” in Australia is?… Well it’s basically none. With Australia's love of draconian cat laws and our over-zealous councils, I could count the number of No Kill shelters nationally on one hand without dropping my cup of tea. So why would these guys be seen as such a massive competitor to the RSPCA? In short, they're not. It's not No Kill shelters or even No Kill advocates the RSPCA is rallying against - but (No Kill) rescue groups who are directly impacting their bottom line, and damaging their reputation as the experts in animal care, simply by existing. 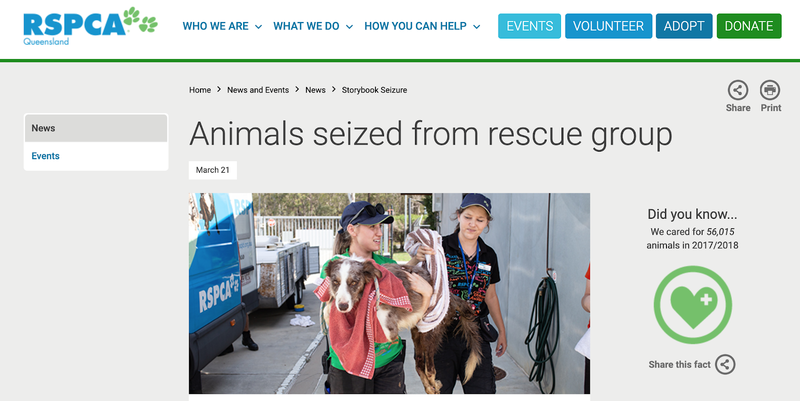 Almost everyone in animal rescue is acutely aware of the horrific conditions found at the recent raid by the RSPCA QLD of Storybrook Farm. Indefensible. Disgusting. And in-arguably, unfathomably cruel. But it’s what the RSPCA said about this case, which should concern anyone who rescues in the state. Chief Inspector Daniel Young said, “We are continually disappointed to see people keeping animals in conditions like this, under the guise of operating as a rescue or sanctuary. Good intentions are not enough. Animals need food, water, clean living conditions and veterinary treatment. If people cannot afford that, then sadly they cannot have animals and certainly should not be rescuing animals. “We are constantly amazed that donations are given to some of these groups and do not appear to have been used on the care of the animals. Running an animal rescue is hard work, and expensive. We know this. We also know there are excellent smaller rescue groups out there and they provide us with valuable assistance, and do great work for animals. But sadly there are some rescue groups that still try to operate on a love of animals and good intentions, rather than providing for the real needs of animals." 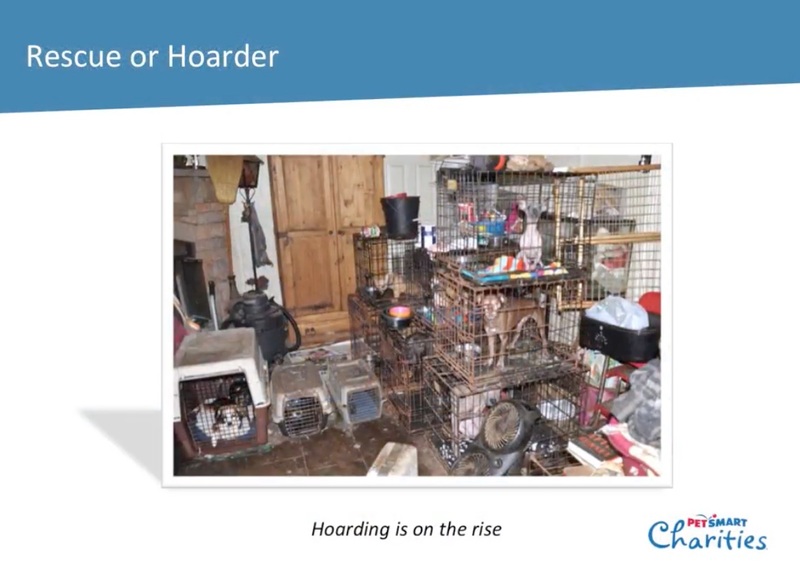 “We often come across animal rescue operations that appear to be a way for people simply to legitimise hoarding behaviour. What you see on Facebook is not always what the reality is behind the scene. Aren’t they just saving animals that don’t have other options? And then - why the RSPCA is a superior choice for support than local rescue groups. Our operations are out in the open. We are accountable. We are required to comply with laws in relation to how we enforce legislation, how we prosecute, how we obtain our money, and how we spend it. Our annual reports, our audited books, our operations on a daily basis, are out in the open. RSPCA is 96 percent funded by donations. Every cent earned is spent working for animals. Without donations from the community, we cannot be here to help animals in need. To donate to our cause click here. ‘‘We would like to be able to work together, it’s about trying to manage competing passions,’’ Mr (Steve) Coleman said. Those who accumulate more animals than they can properly care for are often older single females living alone. These women often have mental health issues, ranging from dementia to obsessive compulsive disorder and schizophrenia. She said there were three types of animal hoarders: the "overwhelmed caregiver", who acquires animals passively and is likely to be withdrawn and isolated; the "rescuer", who actively takes animals into their care believing that only they can adequately care for them; and the "exploiter", who lacks empathy for people and animals and invariably feels no guilt whatsoever. We've seen in Victoria, that it's an extremely slippery slope from 'crazy cat lady' tropes, to legislation where the RSPCA and decide how to regulate rescue and cripples rescue groups overnight. And the RSPCA is ready to roll out legislation to get rescue under their control here too. The reality is you could open up your own rescue group tomorrow, that's how simple it is. And this is a problem where, we're not seeing that accountability; anyone can start up a group. And most people start up with good intentions, but it takes more than an interest in animals, and love for animals to run one of these rescue groups or sanctuaries. This has put a spotlight on it. And RSPCA is definitely going to be working in future with the relevant agencies to help improve this industry. If you're a private rescuer, there's never been a more vital time to network with your peers and cement your value in your community with outreach and positive publicity. And if you're a foster carer, or rescue group supporter, rescue groups have never needed your help more. If you want rescue's to continue to exist in your community - support them. Also PetRescue these are YOUR "rescue members" under attack. Where the bloody hell are you?